Ferdinand Magellan (ca. 1480-1521) - The first expedition to circumnavigate the earth. 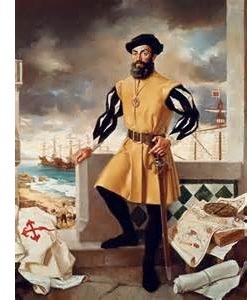 Ferdinand Magellan was Portuguese, but on this trip he sailed for the Spanish crown. This was due to possible insubordination after which he fell out of favor with King Manuel I. After moving to Spain, he reached an agreement with King Charles to seek a westward passage to Asia. Spain was eager to discover such a route after the Treaty of Tordesillas took effect in 1494. This treaty put the eastern passage under Portugal's control (see Treaty of Tordesillas above). Essentially, this trip was intended to complete Columbus' goal of reaching Asia by sailing west. On August 10, 1519, five ships loaded with about 270 men and two years worth of provisions departed Seville (by way of the Guadalquivir River) and headed across the Atlantic Ocean. King Manuel of Portugal sent ships to intercept him, but Magellan managed to evade them. After reaching the coast of South America, he turned south in search of a passage around the New World. Up until then, no one knew it existed. But on October 21, 1520, he found it. Today it is known as the Straight of Magellan. After the 373 mile (600 km) journey through the straight, Magellan and his crew became the first Europeans to enter the Pacific Ocean from the east. And he is responsible for giving that body of water its name, which means "peaceful sea", which he regarded it as calmer than the Atlantic. They managed to cross the Pacific in about five months. But Ferdinand Magellan never made it back to Spain. He died in the Philippines in 1521 at the Battle of Mactan. However, from earlier voyages to the East Indies, for his native Portugal, by way of the Cape of Good Hope (around the southern tip of Africa), he did come within a few hundred miles of circumnavigation himself. The crew continued on under the command Juan Sebastián Elcano. On September 6, 1522, one ship, the Victoria, carrying 17 of the original crew members (and four Asians who were picked up along the way), docked in Sanlúcar de Barrameda in Spain. Most educated humans already knew the earth was round by this time, but the Magellan expedition finally proved it.